It seems like a lot of people have a hard time paying attention these days. Technology has kind of put a damper on the oohs and ahhs that used to come with miraculous stories. There are simple things like drinking fountains and boxed wine that kind of takes the wind out of your biblical sails. People just have so much going on these days and even the best Bible readings are sometimes received with yawns. The thing is, you know for a fact that these epic stories still have plenty to offer. Well, maybe it’s time you upped the ante and gave Sunday School the visual approach! After all, some people are visual learners, so if you want to spread the teachings of Jesus, perhaps it’s time you reenacted a play of the timeless story from the Bible. You can show them how he showed kindness even to those who would do him harm. You can show them how he was compassionate to all of his disciples (even Judas). All it takes is this Jesus costume and all the stories from the Bible! So, at that next church fish fry show up in style! 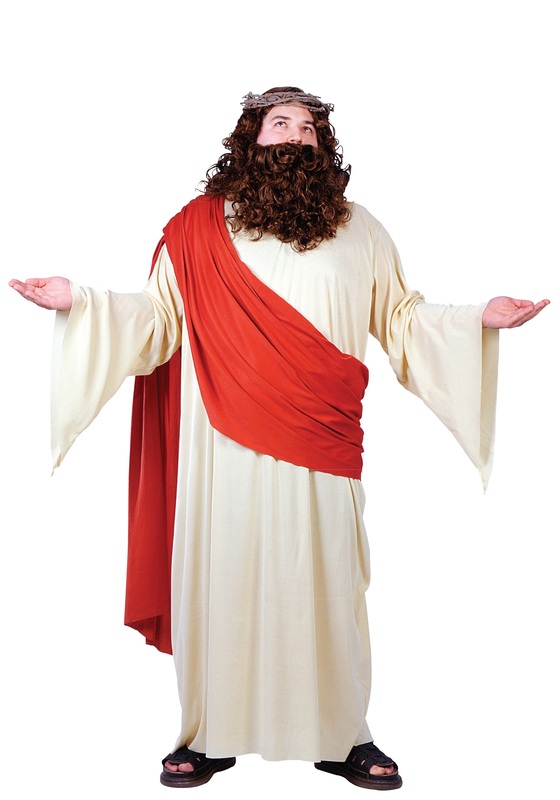 This plus size Jesus costume comes with a floor length polyester robe with bell sleeves. The robe ties in the back for fitting. The included red sash can be worn around the shoulder and body. The costume also comes with a brown, curly wig and matching beard to get that iconic look. Just, don't get ahead of yourself and try walking on water, that's an activity for the original J-man only!